This quick tutorial shows how to manipulate your iPhone calendar events from your PC by drag and drop using CopyTrans Contacts. 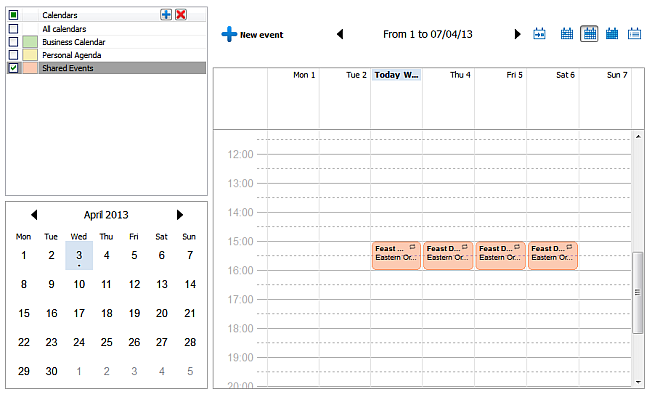 CopyTrans Contacts allows for a flexible unprecedented access to your local iPhone calendars and offers a convenient way to modify via drag and drop your iPhone events’ details such as event beginning and ending times, or day on which your appointments occur. CopyTrans Contacts is compatible with all iOS devices such as iPhone, iPad, and iPod Touch. Run the program, connect your iPhone, and let all of your iPhone data load up. Now, click on the calendar icon. All of your iPhone calendar events are displayed NOTE: if you don’t see some or all of your calendars in the program window, please have a look at this article. To edit an event’s start/end time within your iPhone calendar, simply drag, displace, and drop the event to a desired location on the hour grid when in CopyTrans Contact’s day view. 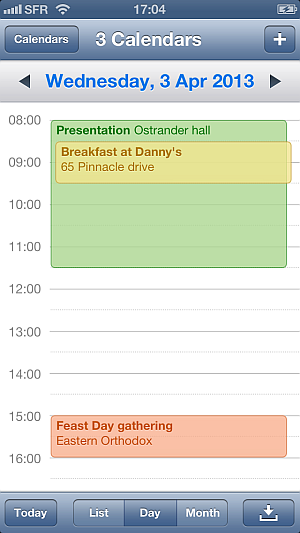 In this example I moved “Breakfast at Danny’s” which initially occurred between 7h00 and 8h00 in the morning to a new time frame: occurring between 8h30 and 9h30 in the morning. You can also adjust the starting and ending times of your iPhone calendar events by placing the mouse pointer towards the top or bottom edge of an event box until you see a small black arrow appear. 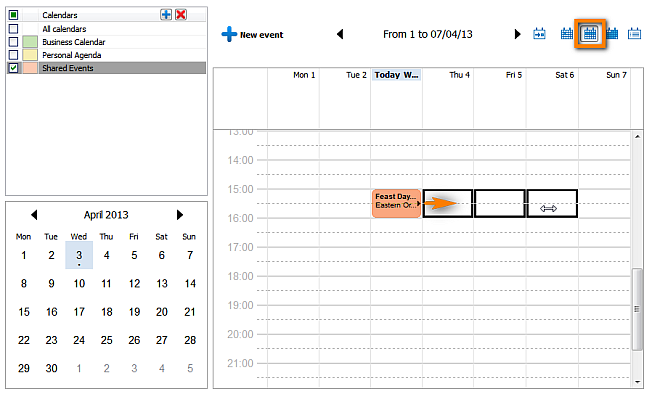 Next simply drag and drop the event to the desired beginning or ending time. In this example, I updated the ending time of “Presentation” from 10h00 to 11h00. To modify the date on which an event in your iPhone calendar occurs, simply navigate to “week view” by clicking on the button marked with orange as seen below. 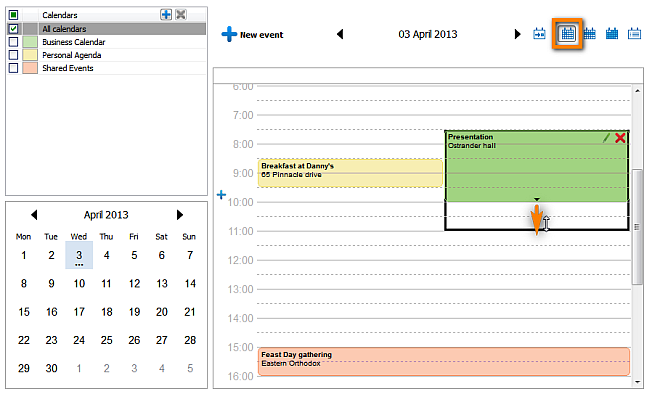 Next, drag and drop an event to the newly-desired day. 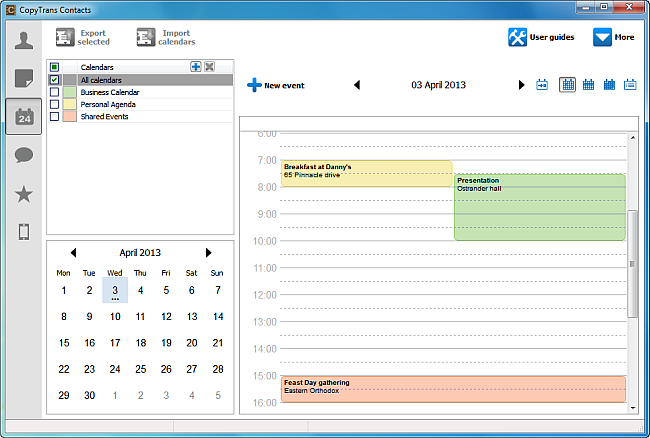 In this example I changed the date of “Feast day” from April 3rd to April 4th. You can do the same when in “month view”. You can modify the way in which events on your iPhone calendar recur over the course of time using the drag and drop function provided in CopyTrans Contacts. 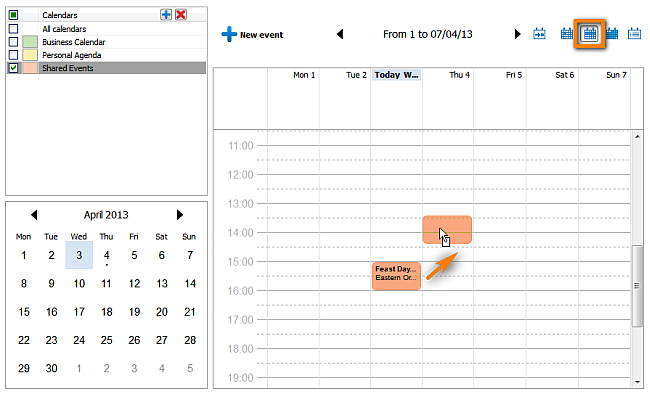 For instance, to make an event recur on four consecutive days, when in “week view” place the mouse pointer over the right edge of an event box until a small black arrow appears. Now drag and drop the event towards the following few days. 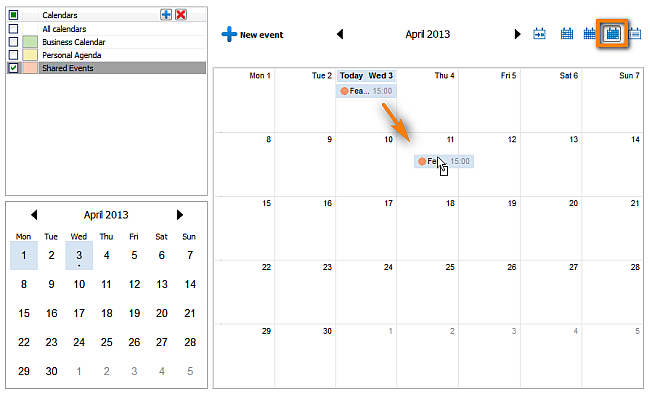 In this example, I edited the event named “Feast day” to occur each day at 15h00 starting April 3rd and ending April 6th. 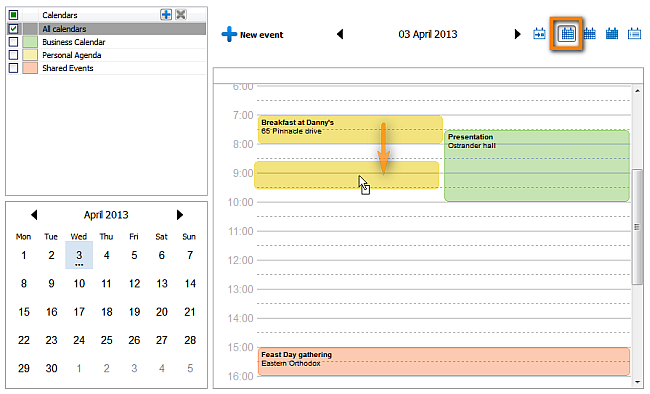 This is how to easily modify iPhone calendar events via the drag and drop function available in CopyTrans Contacts.